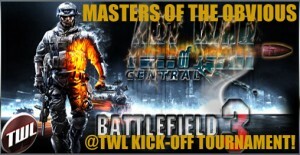 CV in BF3 TWL Tournament! BF3 is launching on October 25th, which is only a few more days away. With the release of the highly anticipated 6th game in the PC series of Battlefield, the TeamWarfare League is proud to announce the BF3 Launch Tournament. Format: 8v8 Conquest Single Elimination Rules: Similar to BF2/BC2 Number of Teams: 64 Maplist: TBD The tournament will have two matches per week, on Tuesday and Thursday starting November 1st. Prizes: five 32 person ranked servers courtesy of Art Of War Central Prizes to be given away as follows: 1 Server will randomly be given to a team that makes it into the 3rd Round 1 Server will randomly be given to a team that makes it into the 4th Round 1 Server will randomly be given to a team that makes it into the 5th Round 1 Server will be given to EACH team that makes it to the Sixth Round Finals All prizes will be awarded after the completion of the round. If you are interested in joining us in this post in the forums and rock and roll! This tournament is now full. Teams are on the waiting list. We can not wait for the game to come out! With our server and practicing to have a good showing on the tournament. This is going to be an exciting season!